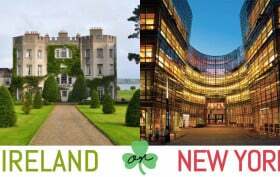 POLL: An Irish Castle or a New York Castle – Which Would You Pick? If this duplex penthouse at 456 West 19th Street were a movie buff it would probably quote Rose Dawson from Titanic, saying, “I’ll never let go, Jack. I’ll never let go…of my $11.75 million price tag.” Okay, so maybe we took a few creative liberties, but you get the point. In 2011, Code and Theory founder Brandon Ralph spent $6.8 million on the pad before turning around and attempting the ambitious flip. For roughly a year and a half, the unit sat on the market before finally withdrawing this past summer. Yet it returns, completely undeterred by its apparent misfortune. 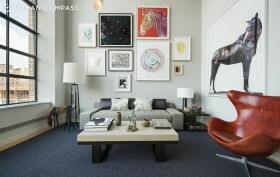 This condo knows its worth… and that number is $11.75 million. Why? For starters, it sits on the top half of the building, where its fluid curves set the entire building apart from the rest. 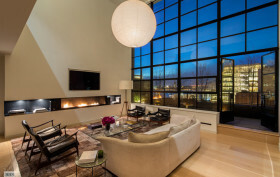 Add to that soaring windows and seamless indoor/outdoor living and you have a winner right in the heart of the West Chelsea Arts District. Now, does that make it worth almost $12 million? We’ll let you decide.